The WonderFair is coming very soon! Since before Christmas, EVERY kid in Grade 4 and 5 in both French and English has been working to design and perform an original science experiment. That’s way over 100 EMJS students! This Friday is the culmination of all of their efforts. That’s the “WonderFair”, a glorious day where all of the marvelous efforts by students (and staff) will be on display for the whole school community! The gym will be packed full of kids showing off their science experiment display boards. The WonderFair will be open this Friday, from 9:30 to 10:20, from 10:45 to 11:50 and from 1:00 to 2:00. Bring everyone you know – all ages are welcome!! To whet your whistle, have a look at this mindmap. 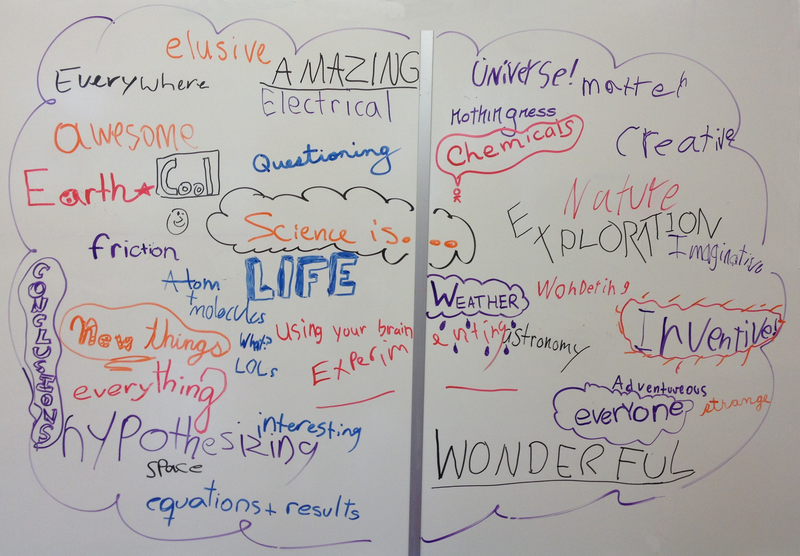 Students were asked to brainstorm one word answers to the statement, “Science is…”. WE INVITE YOU TO ADD YOUR IDEAS BY COMMENTING!